What Size Popup Stands Are There? Pop up stands have long been the bread and butter of exhibitions. Their versatile qualities, effortless portability, budget-friendly price and user-friendly nature has earned them the title of becoming a bestselling display solution for the events and exhibition industry. Every popup stand is reconfigurable. This means that by purchasing a linking panel and extra graphics (if necessary) you can transform your initial popup stand into several completely different variations depending on your needs and your available space. As demand for popup stands has grown, so has the range of sizes and styles. This constant development has resulted in being able to use popups to market any brand at any event. Here at XL Displays, we are the UK’s lead suppliers of popup stands and have expanded our range so that there is something to suit every business, every space and every budget. At over 2m high and less than 2m wide, 3x1 popup stands and 3x2 popup stands are unique alternatives to roller banners. They offer heightened brand exposure and more dimension than a banner because they are slightly larger in size, resulting in more graphic space to create a higher impact. They are available in both straight and curved configurations, allowing you to find the shape that best suits your event. The 3x1 and 3x2 popup stands are our lowest priced popup stands, with the complete exhibitor kit costing less than £400. This makes them a good marketing tool for budget-conscious businesses looking to make a statement at their next event. Smaller popup stands work well alongside other exhibition elements such as tablecloths and promotional counters, as well as in reception areas or for business people who trade on the road. They are ideal when a big display isn’t necessary, but enhanced brand exposure is. We know that sometimes there are restrictions in place when exhibiting – the most common of which are height restrictions. In this instance, a regular sized popup stand might exceed the limitations put in place; meaning you have to find an alternative display solution. If you still want all the benefits of a popup stand but in a way that doesn’t go beyond the height restrictions put in place, a midi popup stand is the best option. 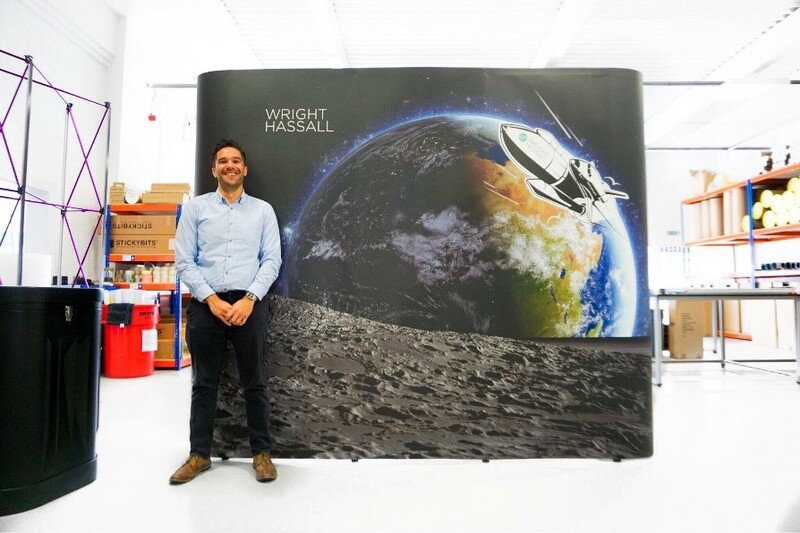 Midi popup displays are shorter than standard popups – standing at 1.8m compared to the standard 2.2m - but they are just as effective and high on impact. They fit into most height restricted areas and retain all of the advantageous properties of standard popups. Midi popup stands are equally as reconfigurable, durable, portable and effortless to use – as well as being just as cost-effective and value for money. They can be linked to regular sized popup stands to create a multi-dimensional display, but are just as eye-catching on their own. 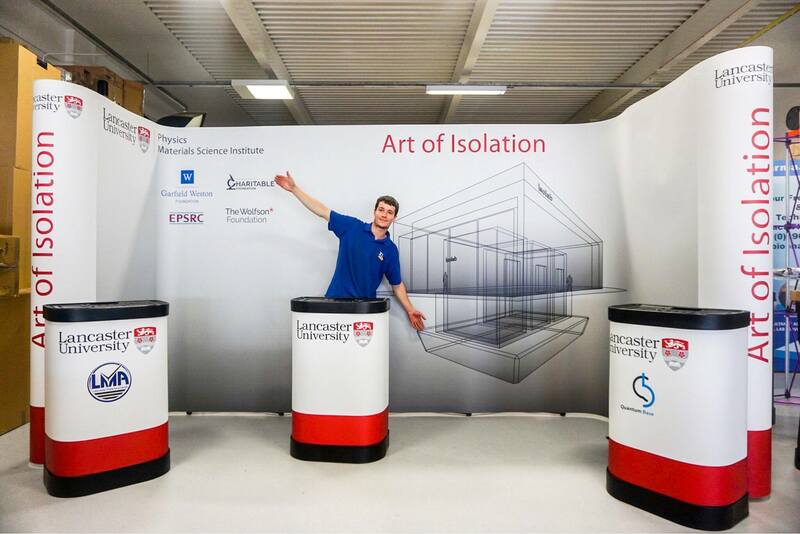 Our bestselling popup is the medium sized 3x3 popup stand. The reason this particular size is so popular is because it fits into the most popular exhibition stand space of a 3x3. 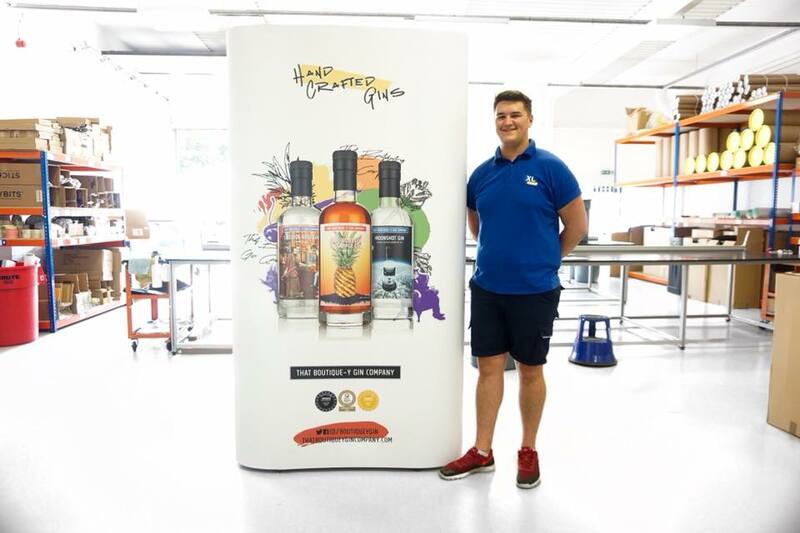 The 3x3 has a generous graphic size, meaning it has the capability of showcasing any marketing message to a stunning capacity. Like with the 3x1 and 3x2 stands, the 3x3 comes in a choice of either curved or straight. The straight version is most commonly used as a branded back wall, whereas the curved version is mostly used within a shell scheme setting. The 3x3 popup stand is the go-to solution for most businesses as it is high on impact but low on cost. For brands who require a slightly larger presence at events, the 3x4 and 3x5 popup stands are a go-to option. As with every other popup stand, the larger configurations are available in both straight and curved. The increased width allows you more graphic design freedom to create a bespoke looking display. If a standard popup display isn’t the most effective solution for your event, a linked popup stand could be the next best thing. Linked popup stands are among the largest format popup stands there is; allowing you to create bespoke looking booths that give you a professional, secluded area to generate leads and close sales. Linked popup stands come in a wide range of shapes, with the most popular being either L-shaped or U-shaped. L-shaped popup stands leave you with two open sides – ideal for floor-only or shell scheme areas where you are exhibiting on a corner. U-shaped popup stands have one open side, making them suitable for when you have an exhibition space that is in-between two neighbouring exhibitors. 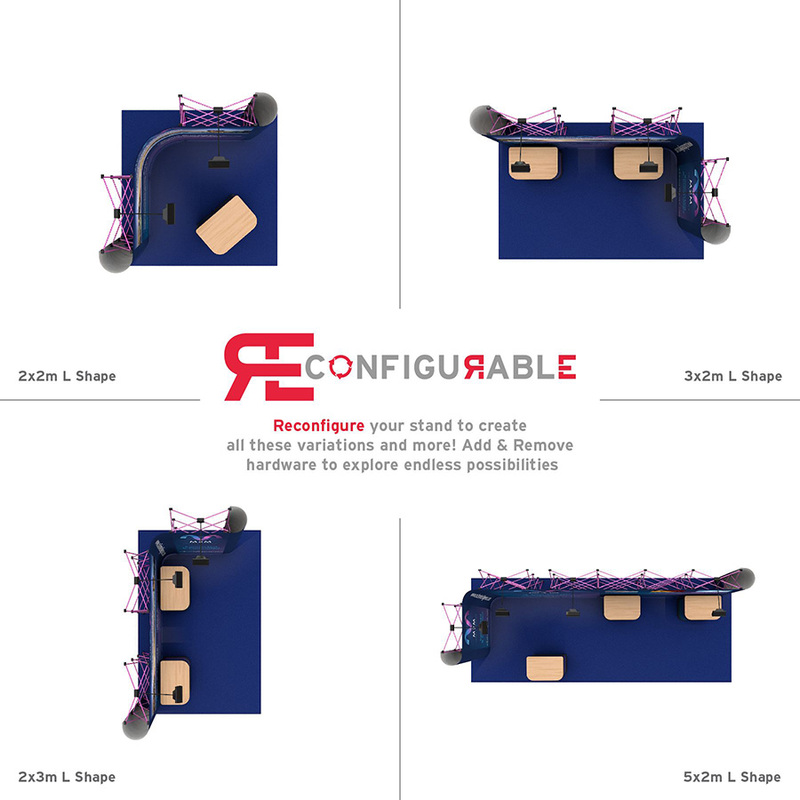 Despite the initial configurations, linked popup stands are completely reconfigurable. This means you can purchase an L-shaped popup for one event, but if a situation arises where you want to use the same popup in a different area, you can easily transform your L-shaped popup stand into a U-shaped popup. You can add linking panels and expand your stand in line with your changing marketing campaigns, and you can just as easily take elements away for smaller areas. This reconfigurable element makes linked popup stands one of the most cost-effect solutions you can invest in because of their limitless variation potential. As mentioned previously, linked popup stands can be adapted to any shape and any size – perhaps the most unique of which is an island popup stand. Island popup stands work extremely well in floor only spaces because they offer 360-degree brand exposure in a professional and sleek way. Island pop ups are frequently used to create separate display areas for brands who have multiple product ranges or services to promote. Each side can be designed in a different way – offering you unlimited graphic design potential. Here at XL Displays, we know that competition to attract visitors at exhibitions can be fierce. We also know that footfall is high, meaning the pressure to have an eye-catching display is increased. In this event, jumbo popup stands are arguably the largest and best option. At over 3m high, jumbo popups have the largest available graphic area – ideal for promoting your brand above your competitors. As with any other pop up solution, jumbo popups can be linked to other jumbos and standard sized displays to create a multidimensional look. If you are still unsure as to which popup stand is the best choice for your brand, call our dedicated sales team on 01733 511030 for further advice.